It’s a big week for Libromance! I launched my first ever book giveaway on the blog — two copies of the book pictured above. August 9 is World Indigenous People’s Day and also National Book Lovers Day, so I thought why not pay homage to both? Head out to this page to check it out and enter — drawing period closes this Sunday, August 13. New feature on the blog: an author index! Now you can see which book reviews are on Libromance by author. An obvious fave: Alain de Botton. See for yourself — click “Book Reviews” in the menu! I cannot be more elated with the number of advanced reader copies I’ve had within the past weeks, and I recently just got Jesmyn Ward’s Sing, Unburied, Sing! Watch out for more ARC reviews in the coming months featuring the following I’ve already read (and I’m getting ready to review): Jonathan Tepperman’s The Fix and Veronica Henry’s How to Find Love in a Bookshop. 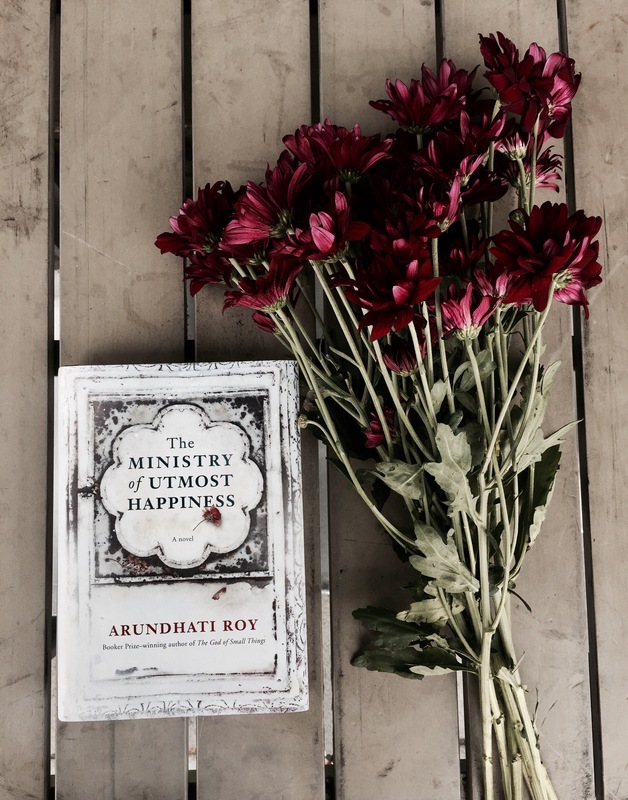 I published my book review for Arundhati Roy’s The Ministry of Utmost Happiness earlier this week and if you haven’t checked it out, head on over here. It’s one of those books that you fully appreciate days after reading it, with the big picture getting clearer as days go by. It is a love letter too, an ode to hijras, mothers, freedom fighters, to Kashmir. The world will thank you for reading Roy’s newest book, so you best get on it. I have been working on it for roughly 10 years. That was when I started putting down things which are in this book right now. She knows everything from the frighteningly euphemistic military terminology of the region (informers are “cats” and so on) to the natural landscape of “herons, cormorants, plovers, lapwings,” and the “walnut groves, the saffron fields, the apple, almond and cherry orchards.” She looks into homes, into bomb sites, into graveyards, into torture centers, into the “glassy, inscrutable” lakes. And she reveals for us the shattered psychology of Kashmiris who have been fighting the Indian Army and also occasionally collaborating with it. Much of what Roy wrote in the book about the Kashmiris’ struggle for independence and self-determination reminded me of the lumad people. The lumad are the indigenous communities in the southern part of the Philippines, which has been under martial law for about two months now. If you’re in the Bay Area next week or know of friends in the area, join me at the opening of an exhibit of artwork by Filipino political prisoners to raise funds for victims of martial law in the country. The woman in the flyer above is none other than lumad leader, the fierce Bai Bibiyaon Bigkayan Likay. For more on women lumad leaders, check out this post I wrote about them. When the external world is teeming with bullsh*t and horrendous stuff (read: MAGAnomics, Trumpism), I usually find solace by going within. This week marked the return of one of Deepak Chopra and Oprah’s 21-day meditation experience, and I’ve been all over it. The theme for the next 21 days is Desire & Destiny and after only a week of doing it I’m noticing the way I respond to things, and how I’m more receptive to the world around me. Today’s mantra was Om Bhavam Namah (I am absolute existence. I am a field of all positbility) — it’s not too late to sign up! And since we’re talking about internal worlds, here’s one from the archives: The Art of Stillness by Pico Iyer. I think that everything important in my life has not come through my mind, but through my spirit or my being or my heart. Everything I trust, whether it’s the people I love or the values I cherish or the places that have moved me, have come at some much deeper level than the mind. And I sometimes think the mind makes lots of complications over what is a much more beautiful and transparent encounter with the world. I’m not sure where I should start after reading Madeleine Thien’s Do Not Say We Have Nothing (Amazon | Indie Bound) but here are three things I know: 1) reading a story that challenges your own political ideology is tricky, 2) it takes a great storyteller to illustrate the complexity and intimacy — really, the humanity — of the other side, and 3) that the author was fully able to transcend point no. 1 and effectively accomplish point no. 2. It is the story of an inter-generational Chinese multi-family, a sweeping epic of politics, love and music. It is an intimate look at how the characters dealt with living in Communist China before, during and after the Great Proletarian Revolution, the demonstrations and the massacre at Tiananmen Square, all the way to Canada for a life of quiet and refuge. What enamored me even more with Thien’s masterpiece is how at the intersection of these families is a piece of delicate literature, the mysterious “Book of Records” which has been passed down from generation to generation. It was an exhilarating and heartbreaking read, the kind that stays with you for days. Even now as I write this review, I can still remember certain scenes in my head: Sparrow at the Conservatory and then at the factories, Swirl and Wen the Dreamer on the run, Big Mother Knife on the train back home to Ba Lute. The book begins with Marie, a ten-year old girl who lives in Canada with her mother. After learning about her father’s (Kai) suicide in Hongkong, she grieves and recalls the most tender moments with him. Soon, the family of two receives a visitor, Ai-Ming, the daughter of Kai’s old friend, Sparrow. It is through Ai-Ming that Marie learns about Communist China, the friendship of their fathers and one of the reasons why Ai-Ming left. Ai-Ming hesitated for a long time before answering. Finally, she told me about days and nights when more than a million people had come to Square. Students had begun a hunger strike that lasted seven days and Ai-ming herself had spent nights on the concrete, sleeping beside her best friend, Yiwen. They sat in the open, with almost nothing to shelter them from the sun or rain. During those six weeks of demonstrations, she had felt at home in China; she had understood, for the first time, what it felt to look at her country through her own eyes and her own history, to come awake alongside million of others. She didn’t want to be her own still river, she wished to be a part of the ocean. In a time when protests are erupting all over the country against Trump’s fascist regime, there were moments when I identified with Ai-Ming and her generation’s struggle for democracy. At the same time, she was living in a much different context, with an entirely different form of government. What was clear to me though was the power of people, (specifically students) en masse to mobilize against the state, a ripple in the fabric of Ai-Ming’s generation heard throughout the world. But the story started way before the massacre, the protests and the hunger strike at Tiananmen Square. The story started right after the Communist revolution in China, when the Party led by Mao Zedong gained control. Revolutionary fervor was high, and Thien gave a glimpse of this vividly through a family living in Shanghai. There was Big Mother Knife, a matriarch, married to Ba Lute who was a Party cadre with their children Sparrow, a gifted composer and the younger brothers, Flying Bear and Da Shan. There was Big Mother’s sister Swirl, her husband Wen the Dreamer and their daughter, Zhuli. And there was Kai, a friend of both Zhuli and Sparrow. These characters all take center stage at some point in the book, overlapping and seamlessly weaving into one another. But first, a few basics. With Donald Trump’s ascendancy to the White House, it can be easy to believe that while elections are temporary, dystopia is forever. Trump’s campaign was rife with the kind of rhetoric that so many people have been fighting against for decades: the struggle against racism, misogyny, homophobia, xenophobia, white supremacy — the struggle to defend and uplift our humanity. Like so many progressives in the country side-eyeing Hillary Clinton, I filled the box next to her name because I just can’t stomach Trump’s rhetoric and the kind of response he incites from his supporters. That even though I am ashamed of America’s imperialism and will struggle to fight it on all fronts, I am also beginning to confront what it means to be on this stolen land. While there have been so many reports and accounts of outright racism in different parts of the country (even in California!) since Trump’s election, I have been inspired by the ways that our communities have shown up for each other. Whether it’s resources like this, or the many forms of protest people have been engaging in, what gives me hope at the end of the day is that we are a resilient people. An offering from my blog: a post-election bibliotherapy which features books I’ve read and written about on Libromance. These books confront different kinds of tension, conflict and contradictions but what they share as a common thread is the ability to understand that the most tender parts of ourselves are also deep wells of strength and resilience. In Night Sky with Exit Wounds, Ocean carries the stories of his parents seeking refuge away from Hanoi. His father is a constant subject, navigating political and emotional terrains. I remember reading “Telemachus” with a profound longing to reach through time and understand the visceral loss of a son, entwined with his father. He takes us beyond what most would not publicly acknowledge, in spite of the increasing and damning evidence. Complicated as he is, Obama is still, for many folks, a symbol of racial progress in the country. Perhaps it is the experience and the perspective of an internationalist such as Teju, can one then really see the implications and reverberations of a messed-up foreign policy. This is America. I think about how a queer, brown Filipino immigrant reads a book about slavery and the black folk’s struggle for liberation. I think about how easy it is to forget sometimes, that sometimes the kind of narrative that arrests our attention is beguiled by the media. Whatever makes a quick buck, as long as it turns the viewership up. How easy it is for Filipinos back home to vote for the son of the country’s former dictator, how easy it is to bury the memory of struggle, how easy it is to pull a trigger. I am a Third World woman living in the First World. And I am both proud and ashamed of the glaring fact that I live on U.S. soil enjoying the benefits of the imperialist machinery but also fully aware that here, in the belly of the beast, are prime opportunities for change. At that moment in the book, I felt like I was the protester and Charles at the same time. I’m in a Third World body with a mind that is increasingly adapting to the First World and at my core I am scared of losing grasp of my Third World-ness, the identity that I am proud of, all the wounds and the scars on my back, the struggles that have defined my existence, of what makes me stand up in the streets. I remember writing The Courage it Takes, with Sunil Yapa earlier this year, when I was in an entirely different place. I was tired and burnt out but I knew that I had to keep on going. When I was reading Ocean’s poetry, I was reminded of the intimacy of personal and political work and the endless fusion of the two. I learned how to look and make connections from Teju, as I pored over his essays on politics and literature. In Colson’s book, I learned the face of imperialism, how liberty is reserved for other people. Last but not the least, I was inspired by the stories of the Lumád women as they continue to fight for their ancestral lands.